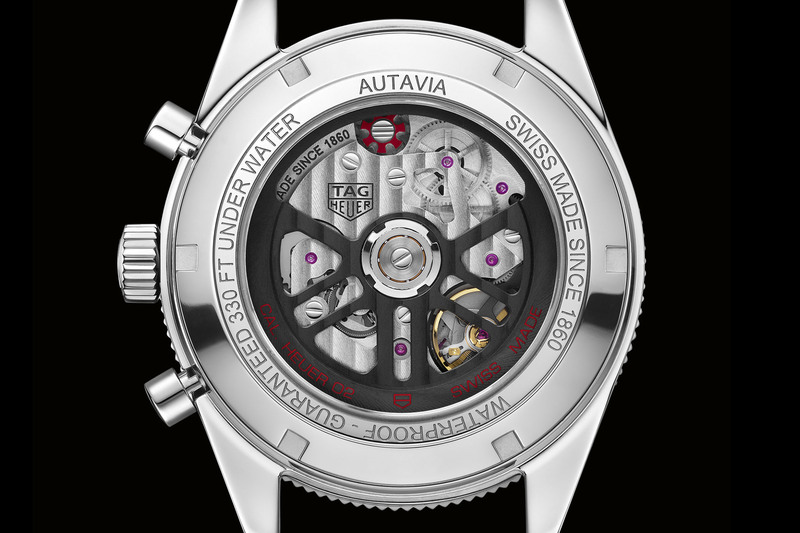 This is it, the big one for TAG Heuer this year, the commercial version of that highly awaited Autavia 2017 Reedition. Most probably, you already heard about this watch, and we, at Monochrome-Watches, covered it when we saw the prototype and its movement. But now, that’s the one you’ll find tomorrow (literally) in stores. 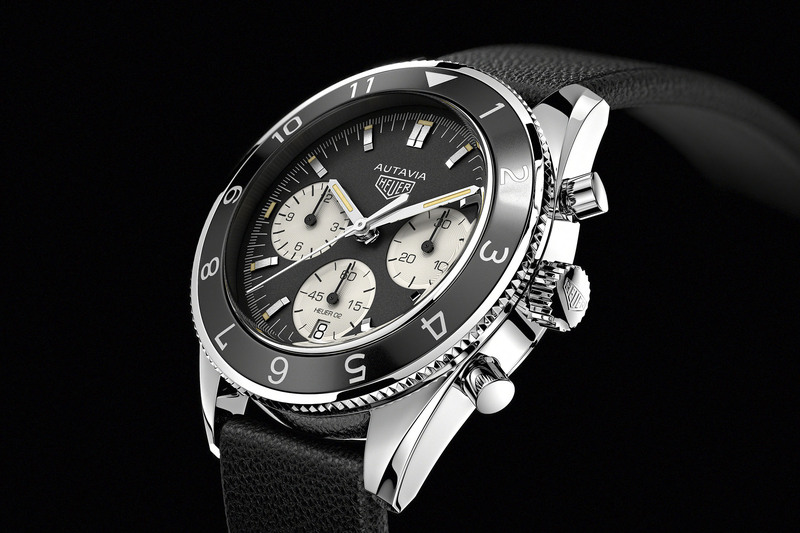 Here is the the Final Version of the TAG Heuer Autavia 2017. Back on the Autavia itself… In 1933, Heuer designed the first dash counter for racing cars and aircraft: the Autavia chronograph. The name was a contraction of AUTomobile and AVIAtion. Yet, this is in 1962 that the story really begins, with the Autavia wristwatch. Jack Heuer, the fourth generation head of the company, created his first wrist sports chronograph. 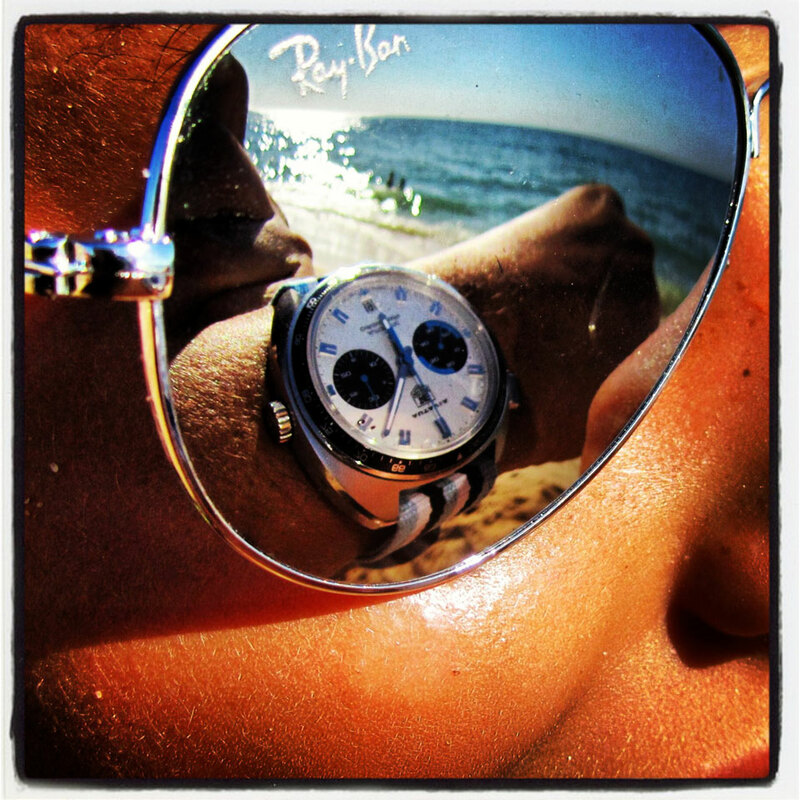 Its innovative signature: a rotating bezel. For many, the Autavia is far more symbolic of the automotive side than aviation. Its ambassadors were the greatest Formula 1 drivers of the 1960s and 1970s: Jo Siffert, Mario Andretti, Jochen Rindt, Derek Bell, Clay Regazzoni, Gilles Villeneuve, Jacky Ickx, Emerson Fittipaldi, Graham Hill, Mario Andretti, Björn Waldegård and even Steve McQueen wore the model – something that was of course linked to the history of Heuer as a brand. Indeed, Jack Heuer was the first Formula 1 sponsor, aside from cigarette manufacturers. 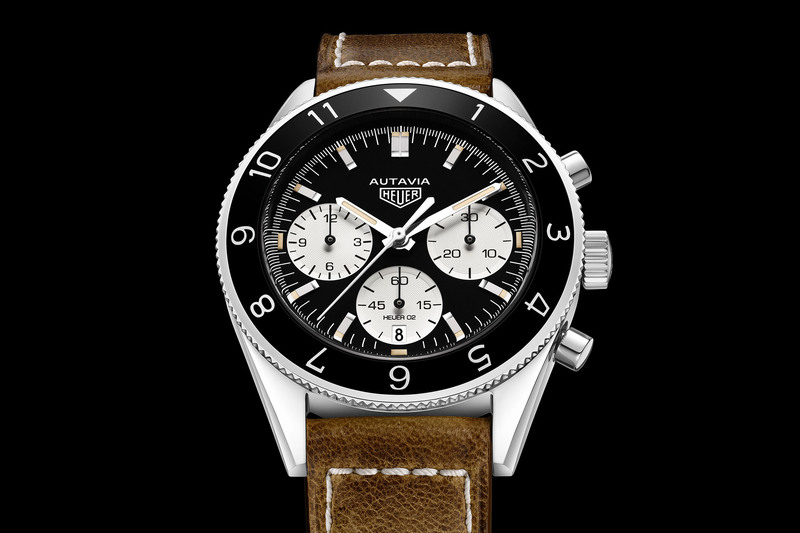 This strong link between Formula 1, talented pilots and the Autavia created an icon, which is today revived. 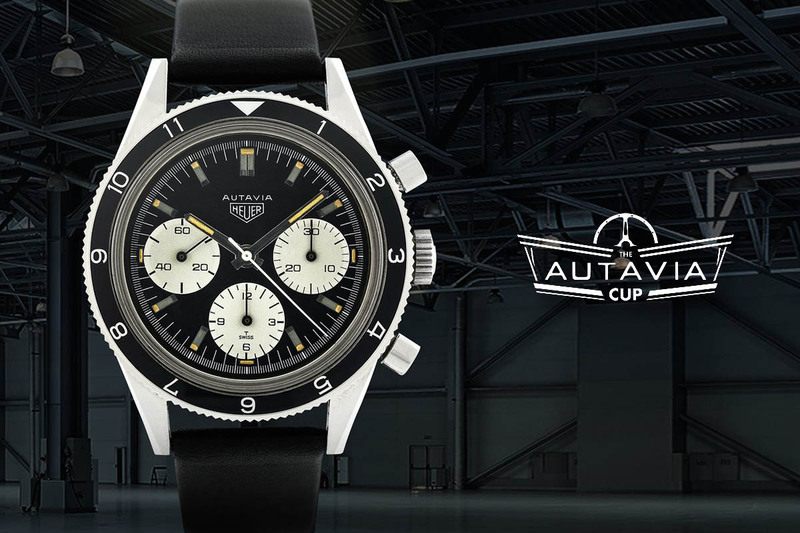 Back in 2016… The Autavia’s comeback results from a unique collaborative campaign — the “Autavia Cup” — held in the spring of 2016. The principle: to consult the brand’s community of fans and collectors and to talk to connoisseurs, offering them the opportunity to choose the historic model that would inspire the rebirth of the Autavia. 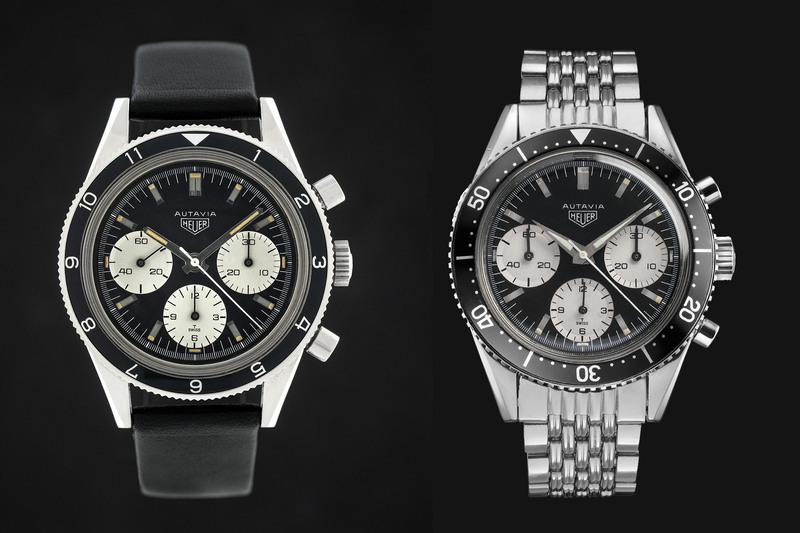 After more than 50,00 people voted, choosing amongst 16 first generation (1960s) Autavias, the result was the Autavia Ref. 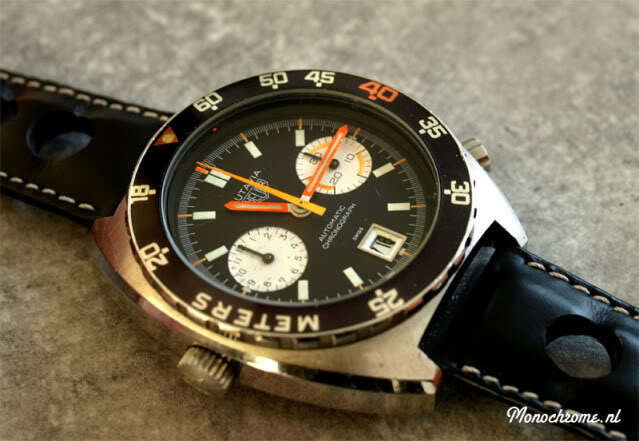 2446 Mark 3, designed in 1966 and nicknamed “Rindt”, as worn in real life by Formula 1 champion Jochen Rindt. Its specificities: a 3-counter “reversed panda” dial, a 12-hour rotatable bezel, straight hands, bevelled horns, straight hands and polished steel baton indexes with luminescent inserts. And this is exactly what you’ll find in the TAG Heuer Autavia 2017. The new TAG Heuer Autavia 2017 shouldn’t be seen as a simple copy-past of the older model, but more as a modern interpretation of an icon. Indeed, if the visuals are actually greatly referring to the 1960s version, many elements are entirely contemporary. First of all, while using the same stye for the case – straight casebands, bevelled horn, mushroom pushers, rotating bezel – the case now measures 42mm instead of 39mm on the old one. Then, proportions also changed on the 2017 Autavia, with a bezel that is wider than before, yet the insert still relies on a 12-hour scale. Yet, overall, the vintage effect is slightly impressive, but with a modern feel when the watch is worn. Good news is the 100m water resistance. The dial of the TAG Heuer Autavia 2017 Reedition certainly is the most faithful part. Indeed, colors, layout, hands… everything is similar. We find back the nice 3-6-9 layout, with a “reversed panda” style, meaning a black dial with white sub-counters. Their position has changed though, with the small second at 6 (and not at 9 as in the 1966 Autavia Ref. 2446 Mark 3). The hands and the indexes are still batons and polished steel, enhanced by a beige luminous paint, recalling the patina of vintage watches. 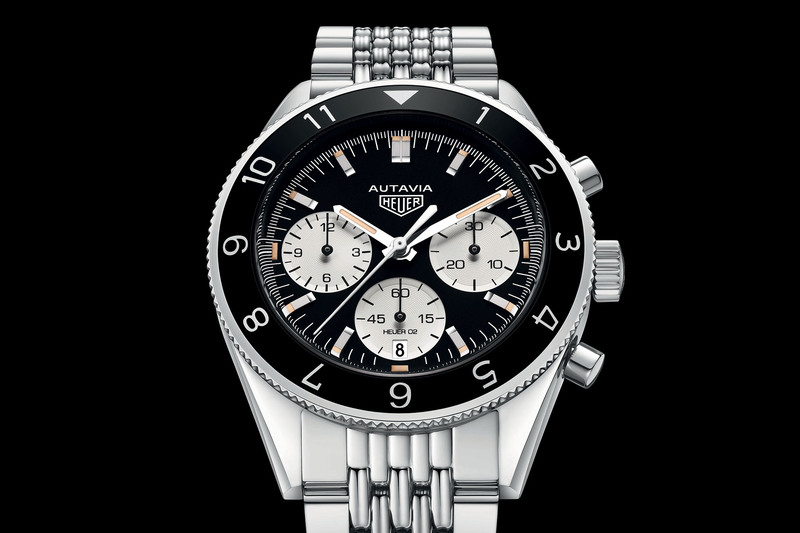 TAG also had the good idea to use the vintage “Heuer” logo and only “Autavia on the dial. One concession to modernity though: the date window at 6 (yet discreetly integrated) – and a certain Heuer 02 mention (more on that later). 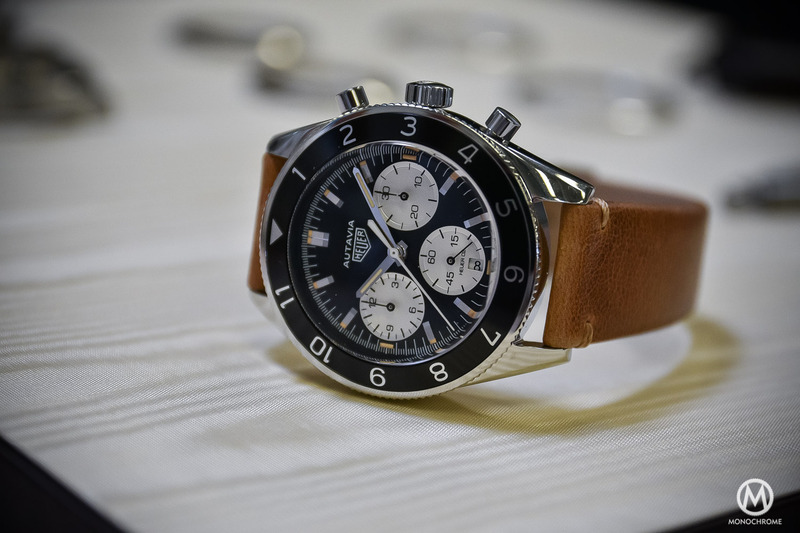 As you can see on the previous images, the Autavia 2017 will be available on various strap options, as for instance a classical black leather strap of a distressed calfskin leather strap for a vintage feel. A good surprise is the apparition of a metallic bracelet (which was not ready when we saw the prototype), again a great design element that recalls the vintage edition. Of course, its construction is now modern and will be to contemporary standards (and knowing how flimsy these vintage bracelets can be, it’s not necessarily a bad thing). The main evolution on this TAG Heuer Autavia 2017 of course concerns the mechanics. Forget about the desirable hand-wound Valjoux movement. 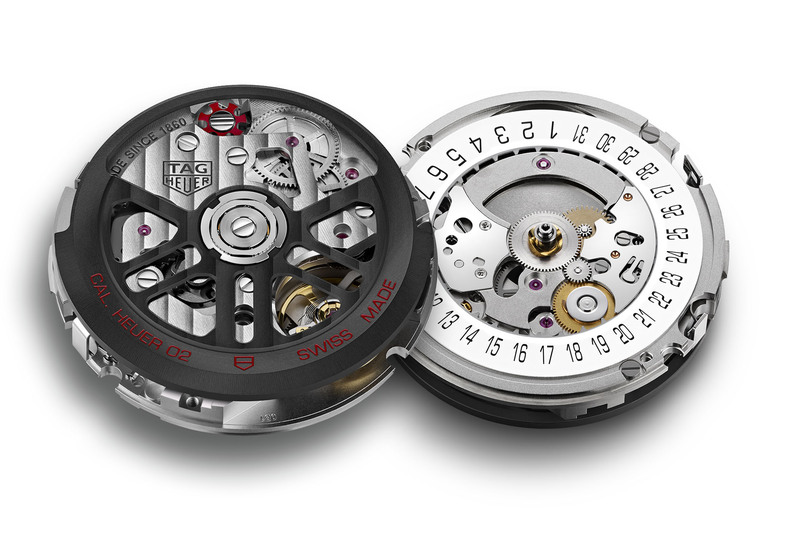 Say hello to the new Calibre Heuer 02… New? Not entirely. In fact, as we explained to you here, this Heuer-02 is the son of the never produced Calibre CH-80, which has been reworked and improved to create this new movement. Visible from the caseback, the Heuer 02 is an interesting calibre, an integrated automatic chronograph, with column-wheel and vertical clutch. It ticks at 4Hz and offers a comfortable 80-hour power reserve. Other advantage: the 3-6-9 layout, more in line with vintage re-editions and the size of this movement, which allows maximum space for the counters on the dial side. its finishing is pleasant, with Geneva stripes, a red column-wheel and a blackened skeletonized rotor. Last but not least, this new TAG Heuer Autavia 2017 benefits from the new strategy of the brand “See Now, Buy Now”, meaning that it will be available, as of tomorrow (24/03/2017), in TAG Heuer boutiques, from a selection of retailers, or available for delivery via the brand’s online webstore. 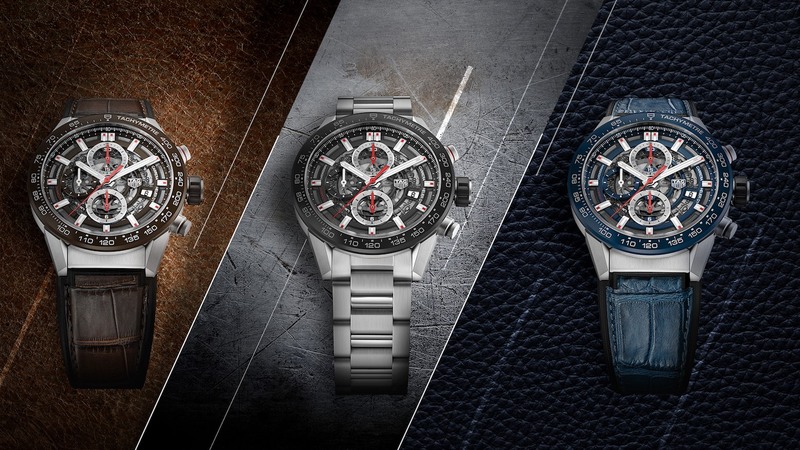 Prices should be CHF 4,800 for the leather strap edition and CHF 4,950 for the metallic bracelet edition. The 30 minute counter (right sub dial) is split in two and a half minute units. How can I read that easily? Good point, and the original didn’t do anything anywhere that stupid. I had the original and it kept breaking down repeatedly within 6month after each servicing even though i only used it as a dress watch where it was never subject to any shock I have since shelved it and replaced it with a Panerai. On the picture with the old and the new side by side, the right sub dial has indices every minute. Odd that they are not consistent. Just realized that they are both the original models. My oversight. Will there be a “smaller lot” of Titanium Autavia 2017 that will made available for collectors? I don’t know where the “rumor” of titanium Autavia 2017 came about. Could you please add clarity to the discussion? Thank you so much.